For me, this season has been a grind. You wouldn't think that blogging about football would be that difficult, but if you think watching Michigan football this season has been tough...try writing about it. Try finding a narrative. I'm wildly jealous of that fan who calls into a radio show and initiates their call by listing their fan credentials, as if that even matters. Or the message board fan who blasts the coaching staff and/or the players after any loss, and somehow it's okay because they have 10 millions posts so they've reached Super Heisman Victor status level. I don't know how that guy thinks that punching he reset button over and over again will achieve the result he's looking for. Firing Brady Hoke, while it may feel good in a self-loathing sort of way, is the absolute WRONG thing for Dave Brandon to do. Good luck finding a replacement when the previous two guys had, honestly, 2 1/2 seasons before the Ann Arbor Torch and Pitchfork clan ran them out of town. Lloyd Carr was forced out after years of public perception that he was a stick in the mud...because Rose Bowls weren't that much fun anyways. Rich Rodriguez was fired after 3 years of painfully not being a #MichiganMan and zero internal institutional support and even less fan support. 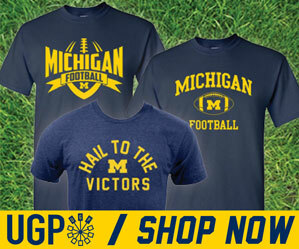 And now Brady Hoke is feeling the heat because some Michigan fans are sad and want their lollipops. I think it's time for the fans to give the Michigan head coach some time to sort things out and keep building the kind of program he wants to build. It's not enough to have to beat Ohio State this week, this Michigan team must also defend themselves against attacks from their own fan base. It's time for Michigan fans to stop being so damn selfish. Winning is a mindset. Champions prepare properly and come out ready to win because that's all they know. That's the mindset in Columbus right now. It was the mindset the minute Urban Meyer stepped on campus. A mindset he inherited from a decade of championship football in Columbus. Ohio State is rolling and their next stop is Ann Arbor...en route to Indianapolis and then on to Pasadena. A Michigan win isn't impossible this Saturday. The Buckeyes aren't unbeatable, they're really not. But Michigan fans are bracing for impact to say the least. How Michigan went from a convincing win against a good Notre Dame team to a disheartened 4-point squeaker against a terrible Akron team 7 days later isn't necessarily the direct byproduct of bad leadership or poor coaching. Ultimately, I think this team just wasn't ready. Even if you have great coaching and a favorable schedule, there are intangibles...like youth and inexperience. Plus, a team must believe they are good enough to be good enough. Being a great college football team is tough, and I think now we're realizing just how good we had it for so many years. You can't just snap your fingers and get it back. But you can rebuild it over time – which isn't what Michigan fans want to hear. You can look at Urban Meyer at Ohio State and make that argument, but you have to realize that Urban walked into a premier program stocked with talent at every position, and top-tier recruiting classes left over from the previous administration. OSU barely skipped a beat despite their coach being fired and a 6-7 season. Neither Rich Rod nor Brady Hoke were able to enjoy those spoils at Michigan. Last week's Iowa game was just the same story on a different day. Another in a series of games we'd all be very happy to forget from 2013. The offensive line played poorly. Michigan couldn't run the ball. 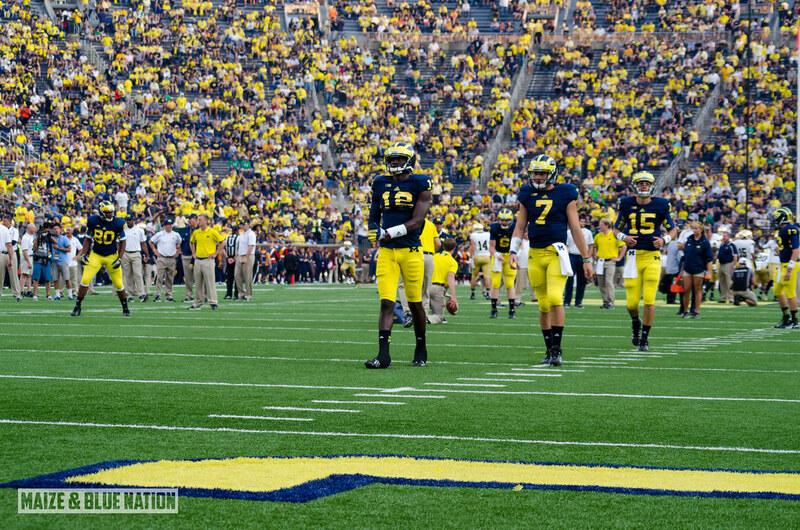 Devin Gardner looked skittish and rattled. So many dropped passes. The defense played well but stayed on the field too long. The play-calling was inept and lifeless. Overall execution just wasn't there. This season feels very similar to the 1996 or 2005 seasons. Good teams that, for whatever reasons, underachieved. They just weren't quite there yet. But the following seasons were very good. Oddly, 1997 and 2006 were years when Michigan had new coordinators on both sides of the ball. So there's that. For a team like Michigan, with some of the most highly-touted players in the country, the best facilities, an enormous and by and large supportive fan base...to underachieve like they have raises doubts and questions about almost everything and everyone associated with the program. Almost all of which have no substantive answers, especially in the middle of the season. So everyone's knee-jerk reactions seem to be the most logical...even when they're probably not. Whatever happens this off-season in terms of assistant coaching positions will play out how it plays out. A week from today, I'm sure we'll be talking about it. But right now, there's one more regular season game to play. Michigan might not beat Ohio State this weekend, but they are going to show up and try as hard as they can. As fans, how can you not stand behind them and show your support...regardless of how hard it is? Being a fan isn't about telling the world how sad you are, it's about being a fan. Don't sell your tickets to OSU fans on Stubhub. Show up, get loud. If history tells us anything...it's that in this game, in this series, anything can happen. Could not agree more! I look forward to reading your blog each week and agree with you 99% of the time! Now matter how good or bad a Michigan team is, I will always have their backs, as that is what being a fan is all about! Cannot wait for Saturday...I have a feeling something special might happen and this could be the beginning of a culture change in Ann Arbor. Devin has to be our guy and if he plays like he can, we will be in this game come the 4th quarter! Good article. I was a student at UM in '69 and was at THE game. OSU came in with a 22 game win streak and was favored by 17. Anything's possible. Go Blue! "It's not enough to have to beat Ohio State this week, this Michigan team must also defend themselves against attacks from their own fan base. It's time for Michigan fans to stop being so damn selfish." Anyone who reads the blog or follows you on Twitter should realize this is as hypocritical as it gets. That goes for you and every other "Michigan blogger." All of you have bashed this team all season long. It's disgusting.